Sciatica is the impingement of any portion of the sciatic nerve causing pain, discomfort, numbness along the nerve path. The nerve pathway is illustrated at the right in yellow. The location of the impingement (the lower lumbar spine) and it’s severity, will dictate the location of the pain and it’s intensity. 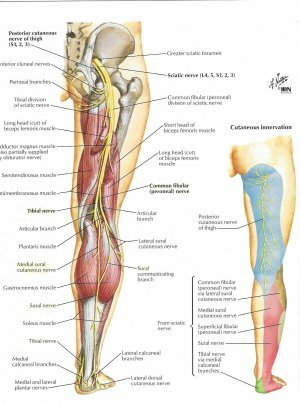 Nerve pressure is the cause of sciatic pain. This usually begins at the nerve's origin as it exits the spinal cord and travels through the lumbar vertebrae. This is often from a subluxation (misalignment of the lumbar spine) including bulging disc, degenerative disc, or swollen disc, and muscle spasm. Symptoms can include, stabbing, burning, aching pain, numbness, tingling, weakness and in severe cases loss of muscle coordination, strength and atrophy. At our Arlington Heights Chiropractic clinic a through examination by Dr.O’Hara, Arlington Heights Chiropractor, will confirm the presence of sciatica. Decompression of the nerve will alleviate the symptoms. Decompression is achieved by a number of therapies including, Chiropractic adjustment of the lumbar spine, Muscle stimulation therapy, Ice and specific muscle stretching. Then a regiment of Physical therapy rehabilitation exercises to prevent your sciatica from reoccurring. All of which can be preformed by Arlington Heights Chiropractor Dr. Kevin O'Hara. Call our Arlington Heights Chiropractic location for "the Chiropractor in Arlington Heights". Fast, easy, and effective.